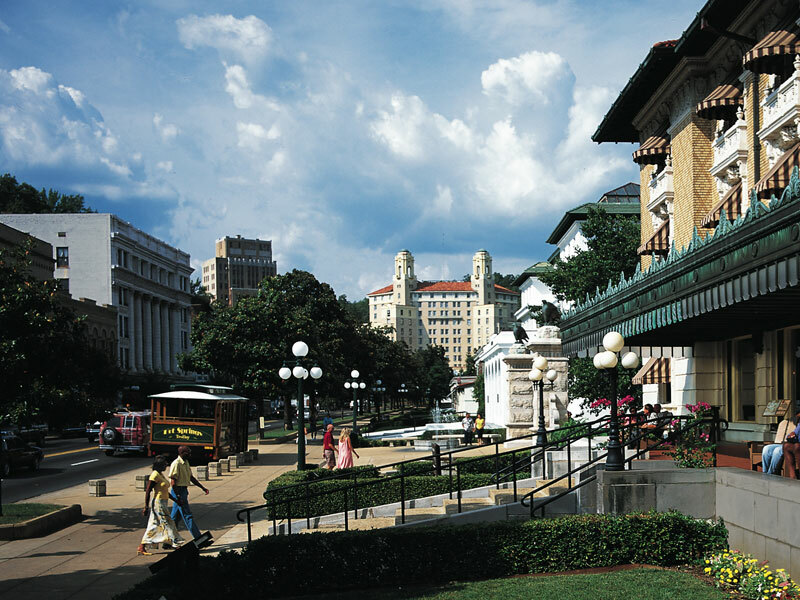 Hot Springs, Arkansas, is named after the naturally thermal spring waters found nearby. Flowing out of the ground at an average temperature of 143°F, the hot springs produce almost one million gallons of water each day. A half-mile stretch running south from Fountain Street to Chapel Street. Central Avenue aerial view and the surrounding National Park. Photo courtesy Hot Springs Department Public Info. Central Avenue has always served as the main thoroughfare of downtown Hot Springs. On one side of the street, historic Bathhouse Row boasts a handful of luxurious, preserved Spanish Revival, Victorian, and Greek Revival buildings. Lining the opposite side of the street is a collection of artisanal shops, art galleries, restaurants, and museums in Greek Revival, Italianate, and Colonial Revival structures. Immediately surrounding the street is the national park land of the Ouachita Mountains, steeply sloping upwards on both sides, stretching out for miles. Viewed from above, the street nestles deep in the valley, twisting and winding between the hills. On the north end, Alice Bush Memorial Fountain sits in the middle of the street and splits traffic into Whittington Avenue and Park Avenue. At the opposite end, Confederate Square acts as an entryway into the downtown. Lace bark elms shade most of the sidewalks, and city parks along the street offer resting spots for pedestrians. 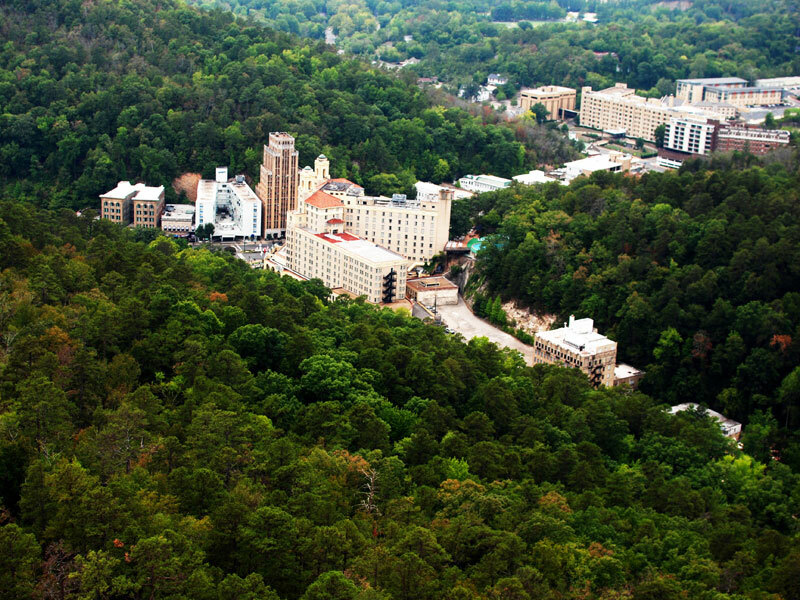 Hot Springs draws approximately 6.7 million visitors each year, generating $523 million in tourism revenue. It is the top destination in Arkansas. Bathhouse Row and the Arlington Hotel. Photo courtesy Hot Springs Department Public Info. 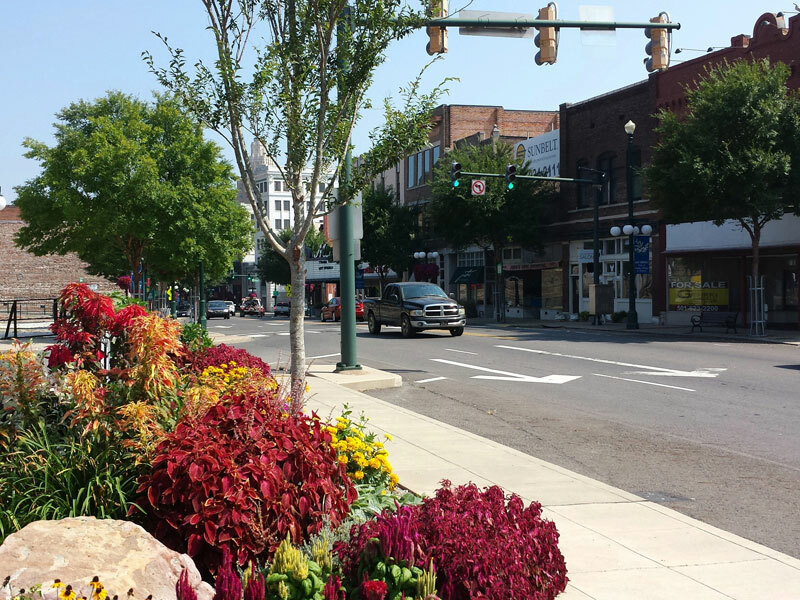 Annual "Running of the Tubs" celebration honors the Spa City's long-time motto "We Bathe the World"
Streetscape with landscaping and historic storefronts. Photo by Jeff Fields.